A hard lump on the top or bottom on the foot can be caused by common skin conditions like warts, boils, cysts, or skin abscess. Another cause of a painful hard foot lump could be a corn, which is a thick layer of skin on the side of the foot. Read below for more information on causes and treatment options. A hard lump in the foot can be a painful and disruptive condition that can affect many day-to-day activities. It is understandable to want to seek care promptly for this condition as it can easily impact your mobility at work and during your free time. The foot is a complex system of bones, muscles, nerves, and ligaments constructed and designed to withstand hours of weight-bearing. Having a hard lump impacting any of these nearby components, or even caused by an injury to them, can lead to further irritation or damage. It's also likely to experience the following with a hard foot lump. If you notice any of these symptoms, make an appointment with your physician promptly in order to get the appropriate diagnosis and care. The feet are divided into three main parts: the forefoot, the midfoot and the hindfoot. The forefoot is composed of the five toes (phalanges) and the five longer bones (metatarsals); the midfoot is a collection of bones that forms the foot’s arches, and the hindfoot is composed of the heel and ankle. Muscles, tendons, ligaments, and nerves run along the surfaces of these structures, providing motion, balance, and sensation to the foot. Damage and injury to any of these components can result in hard lumps and associated symptoms. The feet are also susceptible to the development of hard lumps and bumps due to conditions such as peripheral neuropathy [1,2]. Peripheral neuropathy is the medical term for nerve damage. It results in a loss of sensation and numbness, especially in the extremities. If sensation is affected in the foot, it may be difficult to notice initial lesions. These lesions can worsen and develop into large, hard bumps. Many causes of hard foot lumps are dermatologic in nature and affect the different layers of the skin — the epidermis, dermis and subcutaneous layer. Most of these conditions are easily visible, usually benign, and include conditions such as skin tags, cysts, and neurofibromas . Inflammatory causes that can result in hard foot lumps include the following. Infectious: Bacteria can easily enter cuts and lesions of the feet and result in infectious abscesses — pus-filled pockets within the body tissue . If unnoticed, abscesses can harden over time and result in visible bumps that may affect ambulation, or postoperative care where you resume light activity such as standing and walking. 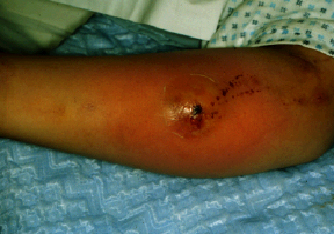 See an image of an abscess on the arm here. There are also viruses that can infect the top layer of skin and result in skin growths as well. Arthritis: Arthritis is a general term for multiple conditions that cause painful inflammation and stiffness throughout the body. Arthritis can result in thickening and swelling that can result in damage and deformity of the bones and cartilage in the form of nodules. See this image for a visual representation of arthritic nodules on the foot. Cancerous causes of a hard foot lump may include the following. Nerve/Muscular/Soft tissue: Growths can often arise from the muscle, soft tissue and nerves of the foot causing hard, sometimes large lumps. For example, growths of the nerves in the foot can result in lumps in addition to symptoms of pain or numbness. Vascular: Growths that result from the vasculature and blood vessels of the body are called angiomas or pyogenic granulomas. They are dome-shaped, appear red, and bleed with trauma. Environmental causes can be related to lifestyle habits or certain exposures. Pressure: From wearing shoes to the ground and terrain and even socks, the feet are constantly exposed to things that cause friction and increased pressure. As a protective mechanism, the skin hardens and thickens and can develop lesions such as corns and callouses. Trauma: Traumatic injury to the foot can result in bruising, irritation and also fracture. The list below shows results from the use of our quiz by Buoy users who experienced hard foot lump. This list does not constitute medical advice and may not accurately represent what you have. A corn is a hard, thick layer of skin that develops when the skin experiences lots of friction and pressure. A corn may cause discomfort, but is of no big concern. Cryosurgery: The application of extreme cold to destroy and remove diseased tissue. Electrodesiccation: The use of an electric current to remove skin lesions. Shave excision: The use of a sharp razor with or without an electrode to feather the edges of a lesion to make it smaller or less noticeable. Scissors: At times the solution is to simply cut off the lesion/lump with surgical scissors. If the hard foot lump is associated with an infection, your physician will prescribe appropriate antibiotics to treat the condition and prevent complications. If your hard foot lump and associated symptoms are due to cancer, your physician will discuss treatment options including surgery, radiation or chemotherapy. Will my walking be affected by my hard foot lump? Your foot lump may make it more painful to walk, and the extent and severity of the pain can be dependent on the location of the lump (forefoot, midfoot, hindfoot). Walking is most often affected by lumps that develop in the forefoot and midfoot. Why is there fluid draining from my hard foot lump? If there is fluid or pus coming out of your hard foot lump, it may be the result of an infectious abscess. Abscesses can arise from a cut or disruption of the skin such as a blister or insect bite and even from a retained foreign body such as a splinter or piece of glass . Are there ways to prevent hard foot lumps? There are many things you can do to prevent hard foot lumps that develop due to pressure and friction. For example, wearing roomy shoes that are not too tight can help prevent rubbing or pinching that can result in corns and calluses. It is also very important to regularly inspect the feet for cuts or lesions so that they do not worsen. Is my hard foot lump chronic or temporary? A hard bump on the foot may be temporary or chronic depending on the cause. Acute injuries that result in bumps such as fractures and infections are often temporary; however, if they are not treated appropriately they can become chronic bumps that are difficult to treat. Why does my foot feel numb in the setting of my hard lump? Your numbness may be due to the lump causing injury, compression or irritation to a nerve or branch of one of the nerves in the foot. However, metabolic dysfunction, such as in diabetes, can result in peripheral neuropathy that can cause numbness, making it more difficult for some people to feel cuts and lesions that develop into hard lumps .